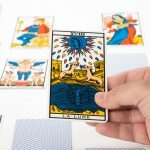 The Tarot is a deck of 78 cards utilized to connect with Source energy, and unveil answers and insight into our lives. The information received assists us in understanding destiny, challenges, and fortunate events to come in life. The Moon Card is labeled card “18” in the tarot deck, and therefore holds a very spiritual meaning when it appears. The Moon Card ​is a card of the tarot deck which helps compose the Major Arcana. The Major Arcana is the first 22 cards of the deck, which can be called the “trump cards”. These cards are numbered from 0 to 21. The Moon Card is labeled number “18,” and therefore also contains the vibrational energy and traits of the Number Eighteen. Some of the associations we will analyze to interpret the meaning of this card include its illustration, the Numerology of the Number Eighteen, and its relationship with the zodiac sign Pisces. The visual of The Moon Card displays a pool of water at the base of the illustration, with a crayfish crawling up onto the land. We also see a dog and a wolf on either side of a path, leading to two separate towers on either side of the card. There are mountains in the far distance, and the centered and largest image on the card is the moon highlighted in the center, inside a bright sun shape. The Moon itself appears to be attempting to sleep. Remember, the Moon rules our unconscious instincts, emotional habits, and shadow self. It only comes out at night, and illuminates all that is unseen without the typical energetic source of “light”. The pool of water, as with most cards, represents the subconscious mind (just as with the High Priestess, Temperance, and The Star). The crayfish crawling from the pool reflects the uncomfortable ideas that come from our inner depths, and the early stages of heightened consciousness about to arise. The dog and the wolf are reflective of two types of our inner selves; the dog reflects the tamed version of our minds, while the wolf reflects the wild version. The path leading toward the two towers is leading the way to unconscious connection and awareness, and the Moon attempting to sleep is telling us that we need to look within to find the answers we seek. Just as the Moon lights up the sky while we sleep, we can find the light in our dreams and intuition, because we will never find the truth we need within others. Our subconscious is where the wisdom of the Universe lies. The Number 18 is a higher frequency of the Number Nine, as it reduces to 9 (1 + 8 = 9). The Number One​ possesses an energy of p​ ioneering, independence, masculinity, confidence, new beginnings, initiation, and individuality. The Number Eight​ possesses an energy of strength, infinity, karma, methodical professionalism, self-confidence, authority, discernment, insight, inner strength, and divine balance of wisdom and practicality. The Number Nine​ possesses the most spiritual energy of all cardinal numbers, composed of: completion, enlightenment, humanitarianism, liberation of material needs, service to humanity, transcendence, soul purpose, achievement, spirituality, the Universal Laws, self-sacrifice, dharma, unconditional love, and lightworking. Therefore, the Number Eighteen ​holds a vibration of independence (1), inner strength (8), and spirituality (9). The astrological zodiac sign of Pisces is ruled by The Moon Card. ​Pisces is the most empathetic and dreamy of all of the astrological signs and most associated with the subconscious. Pisces is adaptable, sensitive, imaginative, creative, emotional and affectionate, but this intense energy finds it difficult to deal with anything that does not agree with or live up to the lofty visions it embodies. Pisces possesses a kind and compassionate nature, one of heightened humane and spiritual traits. It is an intuitive, psychic, and emotional vibrational frequency that has a vulnerability of taking on other emotional energy as its own. This sign loves to dive deep into the aspects of both the spiritual and physical realms, being a natural detective and lover of wisdom and spiritual growth. Pisces is ruled by the Moon card, (aside from the obvious correlations mentioned) because it rules the 12th house of the zodiac. The 12th house is the house of secrets, privacy, escape, vulnerability, and isolation. But it is also the ego-free house, connecting us to compassion, true imagination, sensitivity, and our psychic abilities. When The Moon Card shows itself in a tarot reading, we must remember what we learned about The Star Card. With the Star Card, we were naked and relieved of anything that brought us down, being reminded of all the liberation we had to be confident to shine like we were meant to. With the Moon Card, we are forced into projections of our subconscious that bring up the fears of both our present and our future, after we have finally conquered the hurdle of confident self-awareness. The message of the Moon Card comes with a challenge of deciding how we want to forge those new steps toward a new existence. We now understand who we are, and where we want to go – now is a time of building. And in order to build, we must unnerve and unearth the darkest and deepest areas of our being. When this card shows, it may mean you are in an especially intuitive or psychic phase, and you need to listen to the “silent” messages you are receiving. The Moon Card, (though seemingly dreamy, intuitive and spiritual), brings with it a message of illusion. Maybe everything is not as it appears to be in life, and what needs to be done is a serious soul-searching process. This includes a determined and perceptive understanding of what is hidden inside, before it festers into self-destruction. Dreams, intuition and being idealistic are so important to this lifetime. However, it must be partnered with acknowledgement and acceptance of the darker side within, in order to reap the benefits of a fulfilling existence. Be mindful that not everything is what it seems to be when your head is in the clouds, even if it is a spiritually satisfying place to be.